Discussion in 'Civ4 - Succession Games' started by Sullla, Jan 8, 2006. 1) Every flatland tile gets a cottage. 2) Every hill tile gets a windmill. 3) Universal Suffrage is permitted (and encouraged!) but NO rushing builds with cash. The goal is to have to overcome limited production, not buy everything in sight. We are allowed to build farms/mines/etc. ONLY to hook up resources (this is not intended to be a resource-less challenge). Obviously some locations are going to be drastically short of food in this game, so city placement will be extremely important. Every city must work a cottage or windmill tile if possible (obviously early on there will be some tiles that won't be improved, but we have to rectify that situation as soon as possible. No sandbagging on that!) Commerce will be disgustingly high, but production will be limited, at least until we get some towns + Universal Suffrage. 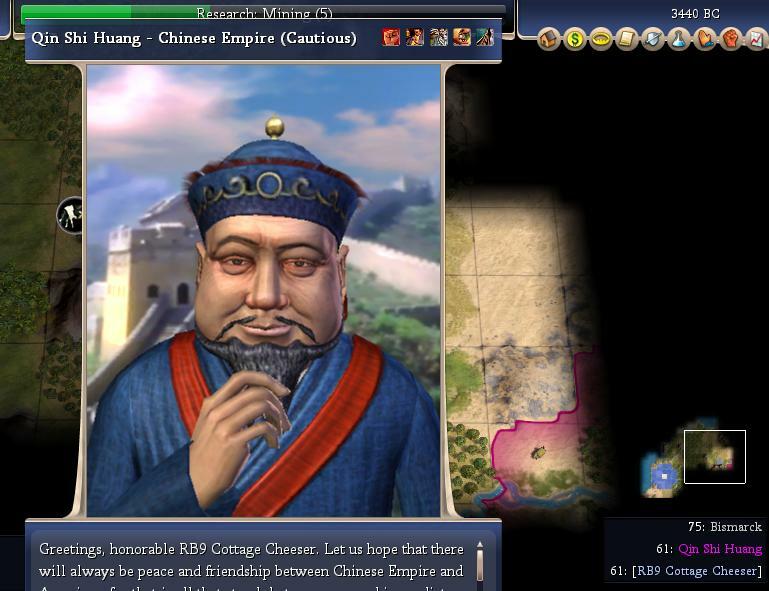 This could prove to be a very easy game... or it might not if an aggressive AI civ thinks that we'd make a tasty snack. We'll have to play it by ear and see what happens. Other: Random AI Personalities, Raging Barbs. Be prepared for a wild opening! First turns to follow this post. We have gold, spices, and ivory all at the start. The ivory and gold we can even get some shields out of! So this looks like a fine place to found our capital. There's also an ocean to the west which (hopefully) will shield us somewhat from the barbs. (Remember, RAGING barbs for this game, be VERY careful!) Our initial research is a Pottery beeline, in the spirit of this game, so we start out researching The Wheel. (This is definitely a non-optimal path, but our variant COMPELS us to beeline for Pottery and cottages first before anything else!) Warrior pops hut, revealing a map. I start building a warrior in Washington, and away we go! (1) 3960BC The founding of our city revealed a hut to the west. Since our borders will auto-pop that anyway, I send our warrior up north to pop another hut that was revealed by the map from the first hut. (Got all that?) We don't have a huge grace period here before barbs start showing up, but I should be able to get to this hut and back. The Germans must be pretty close to have met them this early. We'll see what happens. (5) 3800BC Borders expand and pop that second hut - we draw The Wheel as our free tech! So as cool as it is to get a free tech from a hut, we got the one we were already half-done researching by dumb luck! Anyway, it still helps us out. Research goes into Pottery next, as stipulated by our variant ruleset. (6) 3760BC Warrior finds Germany's borders to the north, and yes Bis is pretty close. Their scout already took the hut that we had seen on our maps. Going to poke around a little more and then bring that warrior home for defense purposes. (10) 3600BC Washington at size 2, finishes warrior, starts on a Worker. Our exploring warrior still hasn't found anything yet. (14) 3440BC Meet Qin to the east. WOW, we're packed in pretty tightly here. That will help with the barbs early on, but things could get real interesting down the road. Fortunately, there's a lot of grassland tiles in the area around the starting position (plains or tundra = very bad for this variant). (19) 3240BC Mining discovered, start researching Hunting. That will let us hook up our ivory resources, which will also be a high priority for our first worker. Seeing barb animals now, but still no warriors, fortunately. (20) 3200BC Warriors in attacked by wolves, but since they're in forest they defend and win without taking a scratch! (22) 3120BC Worker finished in Washington, heads to gold resource. I start working on a third warrior - if you think I'm being over cautious, you've obviously never played with Raging Barbs on before. (24) 3040BC Meet Alex when one of his scouts wanders by. Finish researching Hunting, start work on Archery. We will need archers sooner rather than later! Buddhism founded in a distant land. (25) 3000BC Alex converts to Buddhism, so obviously he was the founder. Maybe there's no Spiritual civs in this game? That's possible, but very unusual. (28) 2880BC Hindu FIDL. No indication who it was yet. (29) 2840BC Washington hits size 3. Warrior due in one turn. My thinking is that we just grow as best we can here in the early going, while making sure that we focus on defense too. Remember, the barbs WILL be coming eventually, but we're so close to the AI civs that they should help shield us somewhat. We're going to end up smaller than usual, most likely, but we will have plenty of financial power. The land here is actually GREAT for our variant, but it's going to take a lot of worker action to improve it. Also beware the AI civs; their personalities are random and they could do just about anything! Lots of decisions to make in the turns ahead. The red dot is a suggested spot for the second city; it's the best I can see but there may possibly be something better to the south. Watch out for Bismack too, this city expands straight towards him, and he may get a city in that region first. Make sure to send two warriors along with the settler and back it up with an archer when possible to be safe. I played 30 to start, Conroe will play 20, Garath 15, then we're back to the regular 10 after that. Good luck everyone. So as cool as it is to get a free tech from a hut, we got the one we were already half-done researching by dumb luck! Its interesting to know that unlike CivIII you can pop a tech you are researching. This game should be very interesting. Will definitely help out on how to deal with cities that are unproductive. You're building a settler that early with only three warriors, jungles that hide enemy units, rivers that slow your units down from accessing roads until, raging barbarians and paper archers?! That's a lot of fog, a lot of directions to defend from, and not good terrain to defend against. Call me an old nanny, but I'd build archers until size 4. I think it is foolish to rely on warriors on monarch / raging barbs. Weren't you the one chastising the rest of us about escorting settlers with warriors? I'd do it on monarch if there weren't raging barbs and a whole lot of fog but . . . May your cheese heads end up not as swiss. Looks like a pretty good start for us Cottagers if those are floodplains sandwiched in between all those rivers. Too bad we will have to trade off the 2h from the trees on the plains though (later rather than sooner though, maybe). You're building a settler that early with only three warriors, jungles that hide enemy units, rivers that slow your units down from accessing roads until, raging barbarians and paper archers?! [...]Call me an old nanny, but I'd build archers until size 4. May your cheese heads end up not as swiss. I'd have built the settler even earlier, myself. It's rare that I wait for size 3 to build one nowadays. Only if I had 3 different food resources to improve that would drastically speed up the settler. Generally with an early second city you can build units to deal with barbs even quicker than if you delayed that second city. edit: Although I can see the merit in growing to 3 due to the gold hill. Then you can work two flood plains plus the gold hill for an early science boost. Lurker: Interesting Game. Should be fun. I'll be following along, good luck. Interesting. One round of turns played and I have already been second-guessed twice on when to build the first settler. This is why I enjoy Succession Games - lots of Monday quarterbacks. Conroe, you get to make a number of important decisions. You are welcome to veto my settler build if desired, but I'll want to hear your reasoning if you choose to do so! I seriously doubt that I will veto the settler. After all, we'll get another shield from that new city center. Situation Assessment: Well, everything looks to be in good shape. DC has a few hammers available to it, at least until those forests come down. I presume that I'm not allowed to work them, though. Our one worker is currently occupied on a road detail. Two of our Warriors are defending DC. The third Warrior is off exploring the SE. The only thing he has found, thus far, is a hungry looking lion. If he survives, he will be eligible for a promotion. Objectives: (1) Pop a Settler; (2) hookup that ivory; (3) explore more of the south; and (4) survive the barbs. Turn 0 (2800BC): Nothing to do but press Enter. IBT: The lion attacks and takes both legs off of our Warrior. After promoting him, he will only need 4 turns to heal. 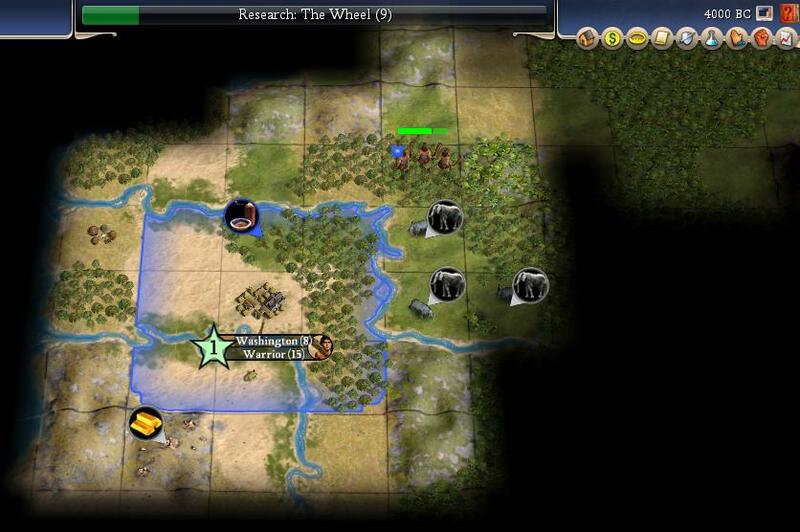 Turn 2 (2720BC): The gold mine comes online. IBT: Qin adopts slavery. Another lion steps out of the fog north of DC. IBT: A barb Warrior approaches DC from the SE. 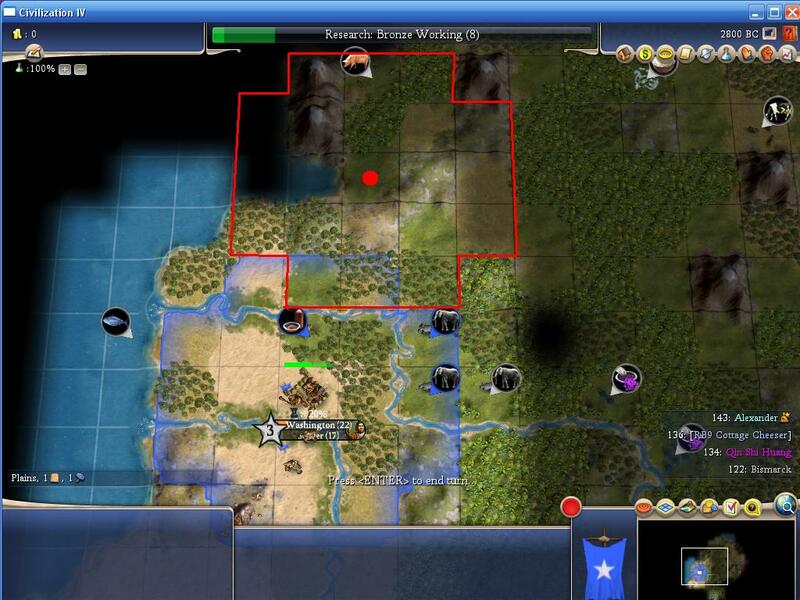 IBT: Qin has an Archer exploring the south. IBT: Our Warrior defeats the barb that is attacking DC. Turn 8 (2480BC): Bronze Working is learned. I start us on Animal Husbandry next, to see if we have any horses. It will be due in 5 turns. We do have some copper, though. 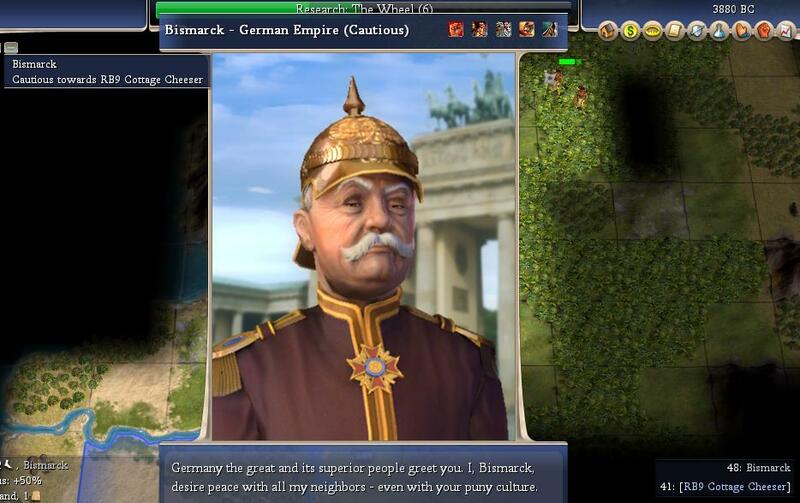 IBT: Bismark adopts slavery. Judaism is founded in a distant land. IBT: A barb Archer approaches from the north. 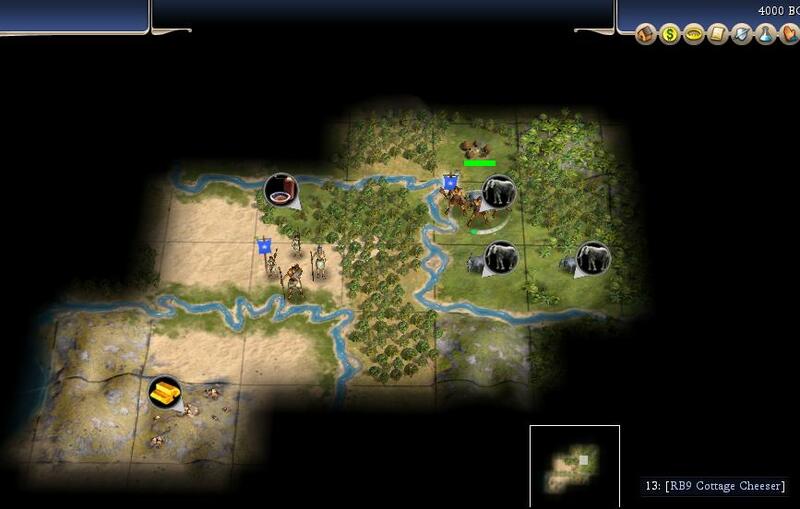 Turn 10 (2400BC): The Settler build gets put on hold for 4 turns, while an Archer is trained. Turn 11 (2360BC): If there were any GH's down south, Qin's Archer has beaten us to them. Turn 12 (2320BC): The first ivory is hooked up. IBT: One of our defending Warriors is killed by that barb Archer. With a 95% defense bonus, we should have won that one! Turn 13 (2280BC): Animal Husbandry is learned. I start research on Writing. Incidently, I do not see a single horse anywhere on this continent. IBT: The barb Archer trys again, but fails. Turn 14 (2240BC): We have our first Archer trained. Production resumes on the Settler, now due in 5 turns. IBT: 2, count 'em, 2 barb Archers approach from the NE. Turn 15 (2200BC): The Settler is on hold, again! I queue up another Archer, due in 4 turns. I also send our wandering Warrior back to DC. Although, he will not make it time before the barbs attack. Turn 16 (2160BC): First barb Archer in place to attack next turn. The other barb appears to be going for the ivory. IBT: They do not attack! They do pillage our ivory. And just for good measure, a barb Warrior shows up from the SE. Turn 17 (2120BC): The pillaging of the ivory has added another turn to the Archer build. IBT: Our Archer defeats the first barb Archer. The other barb Archer and the Warrior are in position to attack next turn. 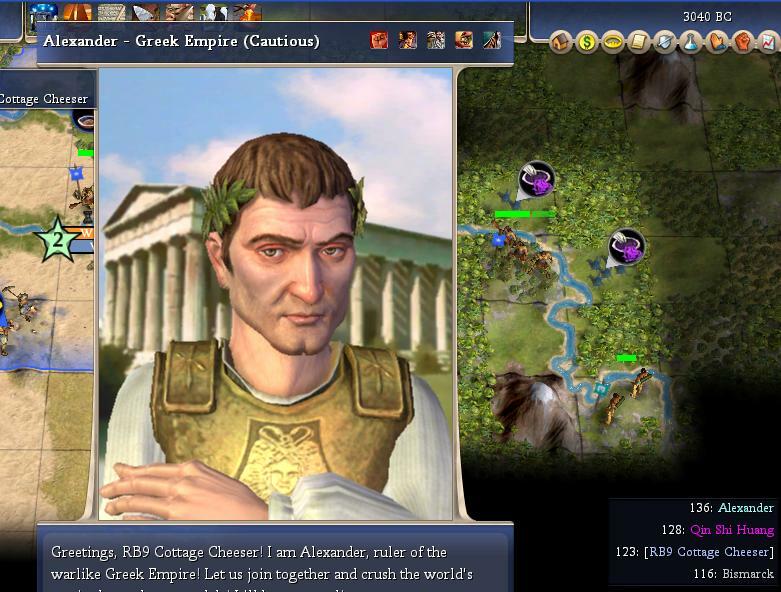 Turn 18 (2080BC): I promote our Archer to City Garrison I.
IBT: Our Archer takes it on the chin from the barb Archer, but manages to win that fight. Meanwhile, our Warrior defeats the barb Warrior. Gandhi's Scout approaches from the south. I took a screenshot, but it appears to have disappeared. Hmmm ... I know I pressed the button, but I've never had one not show up in the folder before. Sorry folks! Not sure what happened. Turn 19 (2040BC): Our newest Archer is 1 shield away from being trained. I put him on hold and resume the Settler training. Because of the loss of the ivory, we are back up to 5 turns for the Settler. We have learned the secrets of Writing. I'm not sure what we should research next. 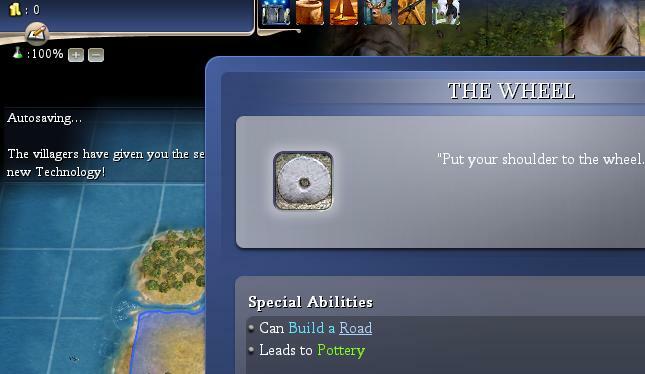 Alphabet (18 turns) is on the road to Democracy, or Masonry (5 turns) because we have stone near our copper source. In the end, I choose Iron Working (12 turns) because of the amount of jungle that we will need to chop. Turn 20 (2000BC): Our borders expand revealing, guess what, another barb Archer in the NE. Our forces should be healed by the time he gets to DC. Well, so much for objectives. The Settler still has 4 turns to go, the ivory is no longer hooked up, and frankly, I did not get much exploring done. I did, however, manage to survive the first barbarian wave. So, I guess I achieved one of my objectives. Note in the picture above that the barb Archer is 2 moves from whacking our Worker. Also, don't forget that I left that Archer sitting in the build queue. From the above picture, you can see that there has not been much movement in the German and Chinese borders. The Indian borders to the south are also fairly close to us. According to the trade advisor, the AIs each have 2 cities. I'm not sure if it is good or bad news that they are not expanding in our direction. One thing I suggest, as we have learned in Meth01, is we need to get units out on hills to force back the fog. The more fog that is pushed pack the less barbs we'll see. I see now why Sullla mentioned getting the warrior back to DC for defense. Wow are the barbs hitting us hard! You folks are experiencing the wonders of raging barbs, a condition that can stagnate you for thousands of years on end. Your best bet is probably to protect a cottage or two and go for Feudalism, but that might be wayyy to far. Best of luck! You folks are experiencing the wonders of raging barbs, a condition that can stagnate you for thousands of years on end. I agree with corbeau: stay focused when it comes to defense. Improvements can and will be pillaged, so limit how much and where you need to defend. I was also concerned because you're building roads onto river plots, and crossing rivers is an automatic full 1 movement point, greatly reducing your logistical ability to defend until construction. Might I also suggest you relocate your yellow dot one square east, and one square southeast, thus making it landbound, but with access to food/river grassland tiles, possibly enough to pay for itself when towns and universal sufferage comes in. Moving yellow SE would require a border expansion before the copper would be available. Copper is the only reason you would even consider a yellow dot. Actually, my original dot map had yellow 2 tiles to the east. Just before I uploaded the picture, I moved yellow to the current spot on the off chance that there was a fish under one of those 3 blacked out tiles. Since then, I've come to realize that all of those coastal tiles could make the city pay its own way once a lighthouse is built. It will still be a junk city, but at least at size 2 or 3 it can pay its own maintenance cost. Of course, if iron is more accessible, the need for a yellow dot becomes trivial. We should know the answer to that one in 11 turns. Why not cottages on hills, too, Sulla? Food reasons? Anyway, this took my next game concept. Guess I'll go to the next one on the list. Only about 300 to go before I start to run dry. Too bad 85% of them will probably never see the light of day. I'll be watching with great interest. "All that is gold does not glitter..."